Whenever someone starts talking about having discolored or black bees, I immediately suspect bee paralysis virus (BPV). There are several flavors of BPV, but the ones you hear thrown around the most here in the US are the acute (ABPV) and chronic (CBPV) types. There's also some disagreement about whether varroa mites are to blame for the spread of these viruses, but from what I can tell the science is pretty firm that at least ABPV is transmitted by mites. Personally, I've had a couple run-ins with BPV, presumably the acute kind. It showed itself in my hives by causing a small percentage of my bees to become blackened (almost charred looking). They had a greasy, oily appearance and some trembled as though they were having seizures. The other bees appeared to be isolating them on top of the upper-most frames, but it's possible they were isolating themselves. The first couple times I saw this I thought I'd accidentally burned the bees with my smoker. But it didn't take too long to rule that out and look for answers elsewhere. Here's the kicker. Symptoms of BPV have only been visible in my hives when the varroa mite levels have gotten out of control. There's little doubt in my mind the BPV was spread by varroa; or at least it was given a foothold in the hives after they were weakened by the mites. 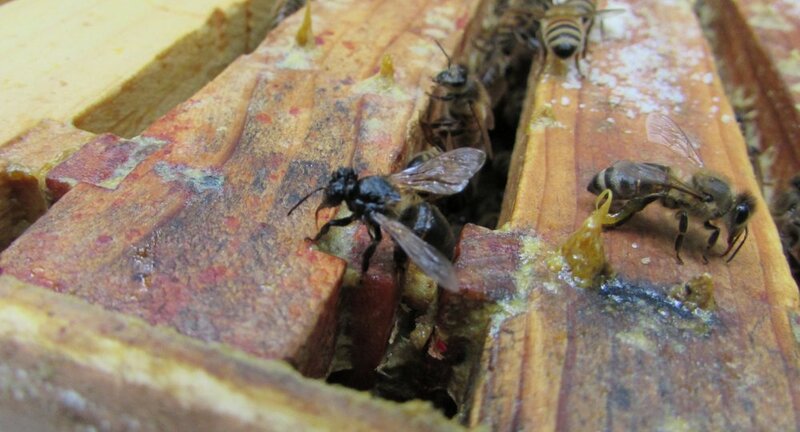 By the time you see BPV in your hive, the mite levels are way, way too high. That being said, after seeing BPV and then working to bring mite levels quickly under control, the symptoms of the virus have gone away. Thankfully I haven't lost a colony to bee paralysis virus, and as long as I manage my mites I suspect it'll remain a minor nuisance.